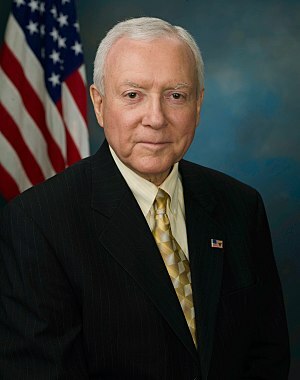 On November 12, 2010 at the Wanship Firehouse, Senator Orrin Hatch graciously took questions for nearly 3 hours and spent additional time one on one afterwards, I find this to be extraordinary. In today’s world of “I don’t have time for anyone”, this was very impressive. Now, we are talking about one of the most powerful men in the world, coming to a very small town, in an atmosphere that may not have been that favorable to him and he also brought his lovely wife of 57 years, I don’t know about you, but that is what I respect about this man, he will dialog with you under any circumstances. I first met the Senator at a county delegate meeting in Park City with my lovely wife of 37 years nearly three years ago, again I have found no one as personable and sincere. I can see how he has lasted this long in politics. I have voted for Senator Hatch in every election except the first one when I was 23 years old and still pretty liberal. The impression he first left with me at that delegate meeting was good and was reaffirmed Friday night. Don’t get me wrong, I would not say the Senator and I agreed on much of anything. Names were taken at the door and placed into a hat and pulled out for your turn. As the evening progressed on, I was ready, and for the past week I had a list of all the ills of our country’s government. Friends and church members all gave me their input, I was fully ready; but as I pondered, I realized that there was only one central issue that needed to be addressed. So, I stood there and waited, hoping my name would be drawn out, question after question and nothing said, I was getting anxious how could the most obvious question slip by and not be asked, and finally Jacqueline Smith breached the subject and Rob Hunt redressed the issue passionately: The Federal Reserve are the curators and facilitators of all evils and had to be eliminated. The whole central bank issue is more than arguably unconstitutional and nearly all of our personal income taxes are going to pay the interest of this giant power mogul. The senator was not very clear on his reason for supporting the Reserve but ended up saying it was complicated; indeed, and guess what, the American people have figured it out, and are awake to this great evil and others are also waking, critical mass will soon arrive. This is what is bugging us about the Senator, how is it he does not know this? How is it that he is deceived when the truth is right in front of him and still does not believe? This is a man with all the inside information, the senior member of the intelligent and finance committees, how can he not know? This is what all the conservatives question, the answer must be, he is in on it, and that being the truth the Tea Parties are fervently working to remove him from office. I am not a Tea Party member but have some sympathy towards their cause, howbeit I would say not to jump too quickly. It is quite possible the Senator has been deceived, whom else would the mass manipulators focus their attention on distracting and hindering rather than this VIP. This is why I say let us try to get him the information. I personally gave him a copy of “The Secrets of OZ” Here by Bob Still, it’s the short version of the “Money Masters” Here which if anyone watches will have the lights go on. If the Senator would get connected with Ron Paul and his son Rand there could be some resounding results, but we must get the Senator to awaken, and not throw the baby out with the wash water. Now, on the matter that really got things stirred up Friday night; Dennis Pace broached the issue of “False Flag Terror” and specifically 9/11 being an inside job. Senator Hatch did not seem angry, but was surprised at the question and simply said he did not believe it was an inside job. This is where I could not restrain myself and questioned him about WTC7, and how it fell in its footprints and no airplane had hit that building, and that 911 commissioners called the investigation essentially a farce. Here Also I brought up Steve Jones a PhD Professor (retired) from BYU that had discovered Nano Thermite Here in the dust of the buildings, which implicates explosives were used to bring the buildings down. I guess this exchange was all recorded by the radio station, KPCW, and was aired the next morning. I might note that Geraldo Rivera ran a favorable show this Saturday on Fox News on 9/11 leaving many questions unanswered by the official story. ; HERE, and introduced a web site call “Building What ?” [Here] I quoted only Main Stream media sources and we had a lively dialog going until some people got nervous and wanted to not talk about it anymore. Senator Hatch, the gentlemen he is, did not leave me comfortless and said it was a subject of interest. Later after the event was over, I talked to the Senator some more, he said I did a good job and commended me. I think that if the Senator looked into the Federal Reserve and the 911 cover up he may be the inside man whom we are looking for. Now with all of this having a high possibility of becoming mute points, being prepared is what our immediate focus should be, community involvement, knowing your sheriff and him knowing you, having a garden, some food storage (most churches have programs for this), be able to defend yourself (the sheriff may not be able to be Johnny on the spot). Inflation is coming, bread may be as high as $25 a loaf soon; there are ways to fight inflation by buying now what you will need later (check expiration), your Federal Reserve notes (fiat currency) are losing value and probably will wipe out your savings and pensions, and taxes could cost you your assets, you need to adjust monetarily. The house of cards is coming down by design.